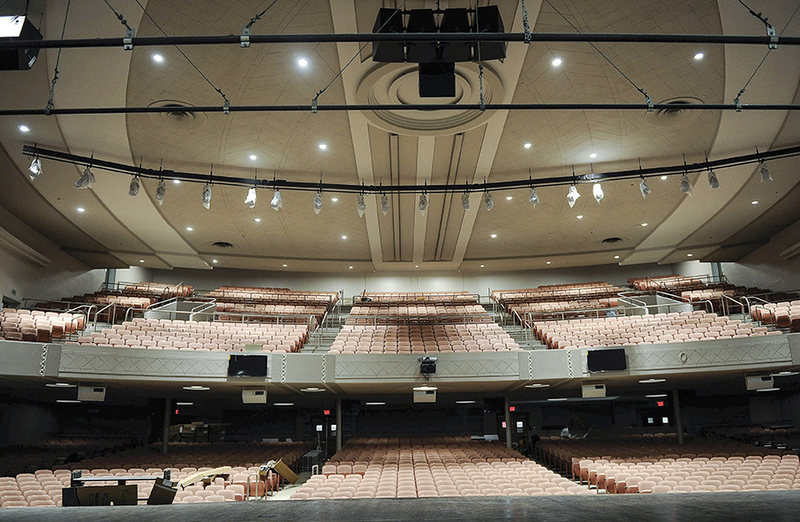 For many towns and cities around the country, the high school auditorium is more than just a facility for the school district – it’s the cultural center for the arts in the community. There is no better example of this than historic Knowlton Auditorium in Austin, MN. Knowlton Auditorium is part of the Austin School District and was built as a community asset in 1937. The auditorium is connected to the high school’s gymnasium. When built, the auditorium was separated from the gym by a removable wall so both spaces could be used for major events like graduation. A remodeling project completed in 1994 replaced the removable wall with a less expensive fixed wall which reduced the usability of the space. 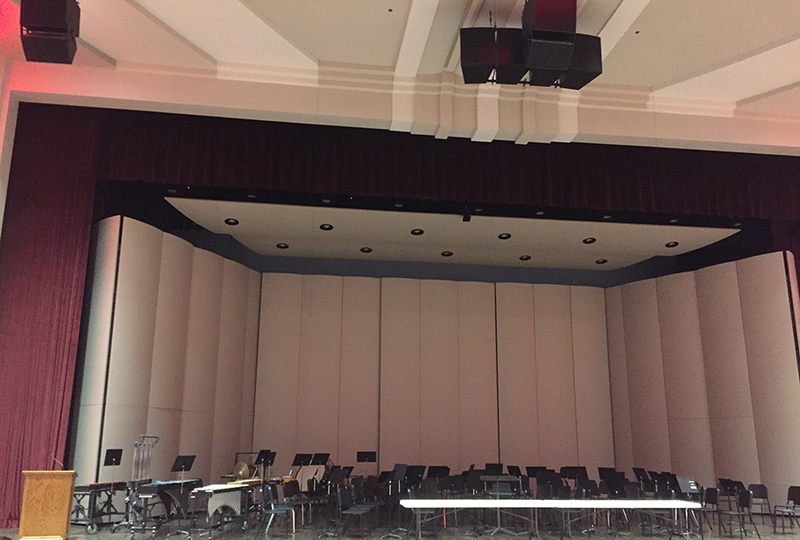 In early 2015, the school district started a renovation project for the auditorium and gymnasium to upgrade the audio and video technology, improve the lighting, provide the space with an architectural “facelift,” and replace that darn wall with a new fire-rated partition. 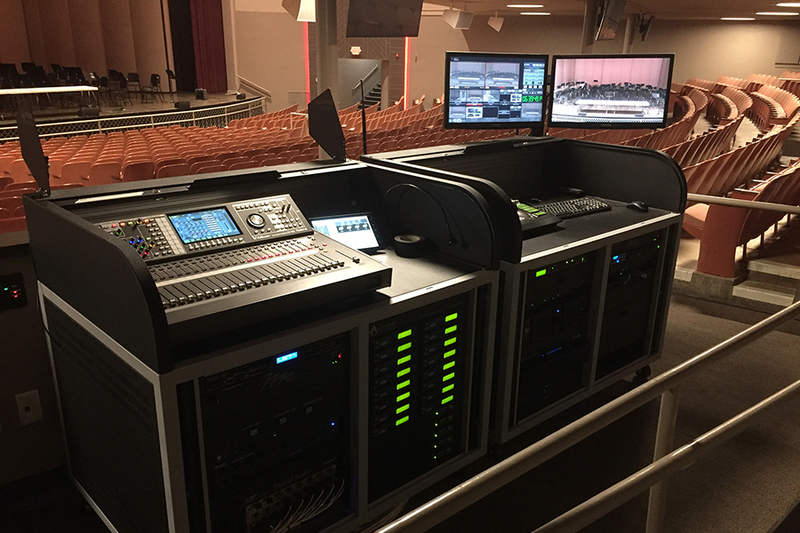 The school district contracted with Dave Bridges at the architectural company ATS&R in Minneapolis to design the new technology systems and with Alpha Video and Audio to integrate and install the systems. As with any auditorium project, the audio systems were the highest priority. Electro-Voice Pro Audio Speakers are installed throughout the auditorium. Left, right, and center speaker clusters are ceiling mounted in front of the stage proscenium with the center cluster containing a low-frequency sub-woofer. Fill speakers are installed under the stage to fill the first six rows, under-the-balcony, and above-the-balcony speakers to provide full sound throughout the auditorium. Two Chief Manufacturing roll top desks are installed at the back of the main floor to hold the mixing systems. Audio is mixed using a Roland M-480 Digital Audio Mixing console. Electro-Voice wireless handheld microphones and Electro-voice headworn microphones are available for the performers. New Electro-Voice speakers are also installed in the gymnasium. New projectors are installed in both the auditorium and gymnasium. A powerful Christie Digital WUXGA, 3-DLP, 12,000-lumens projector is in the auditorium. The projector for the gym is a Vivitek 1080P, 12,000-lumens projector installed in a ceiling-mounted Draper scissor-lift so it can be protected during sporting events. Two 55” LED confidence monitors are installed on the balcony and two 80” displays are added to the lobby area to provide information to visitors and event attendees. Three displays are installed under the balcony to improve the sight lines. The other Chief roll top desk houses a Broadcast Pix Flint Integrated Production switcher which switches video feeds from three Panasonic HD PTZ camera systems installed strategically throughout the auditorium. To improve the ease of use, a Crestron control system is installed which can be accessed by a 10.1” touchscreen control panel installed next to the mixing consoles or by two iPads with Crestron apps. Using the iPads, the principal can now easily control the AV technology from his office. I’ve been impressed with Jake Remus who was Alpha Video's Project Manager on this project. He did an excellent job in catering to the needs of our non-technical users and communicating with us to keep everything on schedule. Since the project was completed, he has been very helpful to answer any technical-related questions or integration questions. I’ve been really impressed with his customer service.